Is the city of Portland, abetted by developer-friendly activists, trying to abolish private automobiles? It certainly looks that way when you consider a report by mayor Charlie Hales’ planning department, a group styling itself Portland for Everyone and several informal groups. A picture in a June pamphlet published by the Bureau of Planning and Sustainability for the Residential Infill Project features a row of four “skinny” houses with driveways, two with cars. A second version of the picture shows the same houses with the cars and driveways photoshopped out. The city doesn’t just make off-street parking vanish. The report allows no “front-loaded” garages at all. Portland for Everyone is pretty much in accord with the city’s call for smaller houses, lower roofs and mostly shorter setbacks. It would go further to outlaw off-street parking. Its website urges us to “end stealth parking subsidies,” that off-street parking runs up the cost of housing and “tilts the scale toward automobile usage and away from forms of transportation that work better in cities.” Works better for whom? Some of us have arthritis, or groceries or young children to carry. We don’t want to drive around the block to find a place to park. Clearly the trend is away from cars. Presently in Portland there is less than one car per household. Perhaps in the future all will walk, ride a bicycle or use public transportation. Do away with garages. Most people use their garages for storage rather than car shelter. I got an “exception” to my permit for a parking space in front of the house. Answering the charge that garage doors are ugly, my house will have a front window and no garage. Make driveways permeable, not concrete slabs. I am using an open concrete lattice. Group driveways for adjacent houses. A driveway has only to be nine feet wide. Adjacent houses could share a driveway that branches off to each neighboring house. Alleys that abut 15 percent of Portland lots. Cleaning and using them for car access would make neighborhoods more livable. Bicyclists, walkers and bus riders have rights. They may be the wave of the future. But it shouldn’t be all at once. We shouldn’t just slam the car door on private transportation. Opinions expressed by these writers do not necessarily reflect the views of Concordia Neighborhood Association. Deadline is the 10th of the month prior to publication. Please contact CNewsEditor@ConcordiaPDX.org earlier to discuss space limitations. This past spring, I was part of a group of five neighborhood professionals – three architects, a designer / builder, and a land use attorney (me) – who collaborated on behalf of the Concordia Land Use & Transportation Committee (LUTC) to address neighborhood compatibility issues with the proposed Bighouse Development at the corner of NE 30th and Killingsworth Streets. These concerns arose from the drawings developer Brian Spencer of Ascend Holdings and builder Rick Porter of Union Corner Construction provided at the February LUTC Meeting. Mr. Spencer agreed to review any recommendations we might provide. In early April, the LUTC submitted the “Bighouse Redesign Team’s” conscientiously researched and carefully considered design changes intended to dramatically improve the building’s integration into the long-standing character of this unique intersection at the heart of Concordia – without negatively impacting its functionality or the project’s overall economics. The most obvious shortcoming of the planned 4-story, 30 unit apartment building is that the design is totally tonedeaf in relation to the surrounding quaint yet vibrant “mini” commercial node. First, though the lot is zoned “Commercial Storefront,” it provides a bare minimum of ground floor business space, sacrificing most of this valuable commercial real estate in exchange for three residential units. Who wants to live on the ground floor at such a busy intersection, with passing pedestrians, a constant stream of cars and busses, and ambient noise from nearby stores and restaurants at all hours? The blinds will be pulled on the first floor residences 24/7. Count on it. Additionally, none of these units open on to the street, a fatal flaw for any design striving for a compatible character. The stated reason they must face inward, with a single shared outside entrance, is for “security” purposes, though many close-by residential and commercial units open to the sidewalk without a problem. Compare the Rexall condo building, a few hundred feet south on 30th, where all ground-floor units face outward – some are residential, some commercial, and their use changes periodically as occupants change. Opening the Bighouse ground level units to the street would preserve future flexibility for commercial use. However, walling them off from the outside blocks the building from community integration, both literally and figuratively. While the Team determined the development, as proposed, does not progress the City’s vision for commercial use of this site, our list of suggested modest modifications sent by the LUTC to Mr. Spencer and Mr. Porter were prudently crafted to address the design shortcomings without going back to the proverbial drawing board. The first and most significant item on our list requests conversion of the three ground-floor residential units to commercial use, or at least making them mixed use live/work spaces with separate entrances to the sidewalk. We also asked that an acoustical engineer be engaged to mitigate Killingsworth’s heavy traffic sounds and noise from nearby businesses, both of which will negatively impact the first floor living experience. Also recommended are several affordable improvements to the building façade to better link it with the neighborhood, including — but not limited to — delineating the building base, upgrading exterior cladding, adding cornices, improved exterior lighting, and integration of sunshades, awnings, and public art elements to enhance the exterior and deter vandalism. The Team’s complete report is posted under the “Bighouse sidebar” on the CNA website. Spencer Parsons is a land use attorney whose home and law office are both in the Concordia Neighborhood. Reach him via email or call (971) 279-2018. Everyone in Concordia has had the opportunity to watch a house be torn down to make way for new houses, duplexes, and “skinnies,” for better and/or for worse. This is the continued chronicle of my personal experience. The finishing touches are now being put up or in. The outside, with the exception of the very limited yard area, is complete. Blinding white and a morose sleet grey were the colors chosen, and the workers who painted it repeatedly joked about the bland choice. To highlight its faux-modern looks, gaudy outdoor lighting floods down from the roof line making the structure seem a cubist alien spaceship that landed mistakenly far from its square launch site. One of the developers repeatedly leaves most of the lights on in the drapeless windows, apparently to act as a beacon for would-be buyers. Driving in his slick Land Rover, he often drives by at odd hours to revel in the cheesy magnificence of his bread box, undoubtedly giddy about future profit. And as I come down my street, any hint of my own home is blocked by these well-lit sheer cliff walls leaving my end of the street cut off from the rest of the neighborhood. It’s a stark reminder of the “new” Portland and its decidedly un-Portland values. Since the neighbors complained to the City about excessive off-hour construction noise two months ago, the noise issues continue. Power saws running after 8 p.m. split the evening silence, and cement trucks chug out their loads at 7 a.m. many mornings of the week, fostering more negative resentment for the project. The only silver lining has been that after a year of construction there is finally a sidewalk – great for the kids and less abled-bodied neighbors who have been forced onto the street all this time. By early June, this two-headed monster will be on the market. The neighbors wonder who will move in. It certainly will not be working-class families, artists or displaced former residents. Each unit, with fake fireplaces and cement pad backyards, will sell for a half million dollars, excluding many buyers. Those who have the cash and appreciate this plastic grandeur of new Portland will likely not value green space, gardening, outdoor hanging out, or community interaction. They will be impressed by the chunky angles, the glaring sharpness, and the blinding lights. Of course, if they are nice, the neighborhood will embrace them with little to no resentment, the long-time residents keeping the communal spirit alive. As for the developers, they will have profited greatly on our neighborhood and given back almost nothing save for a two-year headache and an eyesore which will arrogantly stand forever as a gross representation of the selling out of our neighborhood, our city, our values and our quickly-dying culture that put the good of the community before personal profit. This native N.E. Portlander now has a permanent reminder of his lost hometown right next door. Sadly, with thoughtful urban planning and reflected city regulations, it wouldn’t be this way. Contact Portland City Council, get involved with the neighborhood association, start a petition. The question is not if we change but how we change. Luke Griffin is a native of Northeast Portland. A committed social and environmental activist, he has written for numerous publications, dedicated time fighting for civil rights in housing, served on the CNA board, and utilized world-bridging communication and management skills for the positive betterment of society. He is currently a freelance writer and is completing his Masters of Teaching at Concordia University. Reach Luke by emailing lukeg003@gmail.com. The project next door has been going on now for over a year and a half. Very little of it could be described as “good” for our street. Between the profit hungry, rude developers who threaten neighbors, to the out of place monstrosity now looming over the quaint surrounding houses, to the heartless city government with its intentional ineptness—aiding and abetting the project while sacrificing Concordia’s character so as to rake in more revenue—the process has been utterly depressing for this native of NE Portland. Such projects are not simply about demolitions and new construction but instead reflect who we are as a city and sadly, many of the Portland values that led us to love this place are being destroyed as quickly as the old homes. The only good part of this entry is that a new foreman now controls the job site. In an apparent “180” from all past experiences, he seem to actually care about the people impacted by this project. His first day on the job he apologetically came to my door to talk with me. It wasn’t a canned, corporate spiel but a real conversation. He said he was brought on to do the finishing work but would make sure to talk to us about anything from fences to tree lines. He seemed to truly be open to suggestions and indeed worked with me on the shared fence. He also made sure the job site was cleaned up, the outhouse was taken off my property, and the crews polite. As much as I loathe the cheap monolith next door, he did not design the post modern, San Diego bread box nor did he decide to plant it smack dab in the middle of our quiet block. So how could I dislike him? And it is exactly this sort of deference, along with an open dialogue with the neighborhood, that is needed to have progressive change in our town while protecting livability, history, and culture. The finisher says he is like this because he lives in a similar neighborhood in SE and tries to imagine if this was happening next door to his family. Unfortunately, his attitude is rare and there are no regulations from the city to ensure those who care only about ballooning profits without connection to the community will be so thoughtful. Like many blocks in Concordia, ours has an alley. It was a green corridor with some unkept places, but pretty with flowers, trees, and grass making it a little nature trail. But not anymore. The City decided the duplex must have off-street parking accessed from the alley; therefore, the entire length had to be leveled, graveled, and at the entry points, paved. The developers did not want to pay for it and even ironically argued the neighbors wouldn’t like it. The City inspector said he didn’t care. The alley was City property and they could do with it what they wanted. To the chagrin and detriment of just about everyone, the alley way is no longer green and in the summer the rocks will be piping hot. Because it is still a narrow, hard-to-access alley, we all expect the new owners to park on the street anyway. Everyone in Concordia has had the opportunity to watch a house be torn down to make way for new houses, duplexes, and skinnies, for better and/or for worse. This is the continued chronicle of my personal experience. Unlike last year, this winter has been very Portland: rainy, dreary, and chilly. It seems it has rained every day since November. The rain is great though, especially after a year of drought, unless you have a poorly designed duplex next to you with no gutters. Then, you get a pounding waterfall cascading down onto your side yard, foot deep water the length of your house where your grass and flowers once lived, and a serious potential for dreaded basement flooding. One morning during a deluge, I went outside to assess the damage. Because the building was poorly designed, the roof did not send water down the front, back and sides, off many peaks like normal houses in the area, but instead directed the waters into the center and then off to each side. Without gutters, there was a sheet of water pouring off and into my yard. Witnessing this, it was obvious there was a real chance of the water swamping my basement. I had yet to complain to the developer about anything but thought he should do something now to keep my house from flooding. I called him and without any apology he told me they would do something sometime soon. I explained he really needed todo something ASAP, but he dismissed my worry.And in many ways, why wouldn’t he? There is no city code mandating that developments have gutters, real flood control, or anything that would protect neighbors. If my house was flooded, it wasn’t his problem. There would be no fines or actions taken by the city according to officials. And, as the developer does not live in the neighborhood, he wouldn’t have to deal with meat all. Panicked, I tried one last time to get him todo something. He hung up on me. I called the city inspector and was told there was nothing against the law, the city had inspected the site during the survey and would not return until final inspection. I was transferred to erosion control. They told me I could dump sand in my yard. Later that day workers had covered the swampy mess with hay. The rain continued. The next month was continuously wet. Though no visual water seeped into my basement, the humidity got to 90%. I know: I can’t prove the cause, so said the City, but the conclusion isobvious to most. On top of this issue, one Sunday loud construction began at 8am, a violation of the noise ordinance. Numerous neighbors complained. The police finally showed up around noon but the work did not stop until about four. At most, the developer received a $250 fine for the incident, a tiny drop in the bucket compared to the expected profits of over half a million dollars. The workers kept piling trash in front. They repeatedly blocked my driveway and rudely told me they’d eventually move. And the City? Well, there wasn’t much they would do about any of it. With few regulations, minuscule fines for infractions, a maze of uncommunicative bureaucracies, and little motive to hinder the development boom, they were of no help, even if the lady at ONI was nice. The City That Works…but for whom? Five weeks of almost continuous rain after the yard flooding began, they finally put up gutters. Luke Griffin was born and raised inNE Portland. He’s been a Concordia resident for the last four years, and is a former CNA board member. Luke works primarily in the legal field engaging in social justice in the areas of employment, housing and the environment. OPINION: Will new development continue legacy of work in Concordia Neighborhood? At first glance, the four-story apartment building slated for construction at NE 30th & Killingsworth feels like an all too familiar tale in Portland’s busy infill development market. But in the case of the 30th & K apartments, it’s the cast of characters involved and their existing relationships with the Concordia neighborhood that make it interesting. In fact, the three key players involved with this new project have a well-established legacy here, specifically through their recent involvement in numerous expansions of nearby Concordia University campus. In light of this significant history with Concordia University, it begs the question of how these three parties came together for the new 30th & Killingsworth development and whether the university is somehow involved. Considering the university’s involvement in the new Concordia Student Housing, currently under construction only thirteen blocks away on 17th & Killingsworth, it’s not a stretch of the imagination to wonder what might be in store for the new 30th & K apartments. And while there is no doubt that this development group has built an impressive legacy of work in our area, one thing is certain: the Concordia neighborhood hopes that those involved in the 30th & K apartments will build upon their legacy of work by creating something that meaningfully integrates with the community and becomes something that the neighborhood will point to with pride. Joe Engelsman is a Concordia resident. Construction on the modern brownstone has been going strong now for months. It is a daily part of our lives that impacts the entire street. Whatever it is, my attempts to remain neutral and not let it bother me are beginning to break and I think it is time for a good rant rather than a building progress report. The building is an eye-sore blotting out the sun and supplanting green space. Yes, beauty is in the eye of the beholder but there are some features to this development that are simply factual. On a street of quaint houses, this cubist design is like a large brick in a bed of round river rocks. The size of it is out of place as well, a bulking square cutting the neighborhood in half. The building itself is placed the bare minimum 10 feet from the sidewalk and 5 feet from the side property line. On a block of pretty front yards that is used to being filled with playing children and floating butterflies, this thing juts out breaking up the pleasant view of the middle class dream with all of its hulking indifference. There is no front yard, the classic feature which makes NE Portland neighborhoods so pretty and beneficial to the environment. For a city wanting to increase green space by 30%, this project seems like a total affront to our values and utterly disconnected from the neighborhood. I take issue with the lack of notices we receive from the City and developers. Throughout the entire process we have received a total of two notices before the work began. However, since work has started we have found our street repeatedly closed, our cars often boxed in by double parked semi trucks, and the road itself torn up and poorly patched. I don’t really mind the street closures and loss of parking, as I understand their necessity during construction, but it would be nice to get some advance notice as we go along. Some people think we may benefit from the new house because, thanks to this awesome development, my home’s value will increase! This, however is a bit misunderstood and is often used as an excuse for the continuation of these ill conceived projects. 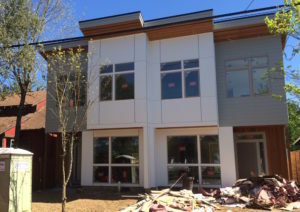 It is actually my house and the houses around, along with our vibrant community, easy accessibility to local businesses, and generally lovely, connected, close-in neighborhood that motivates builders to demo and devo in the first place. I am also not planning to sell my house anytime soon. Maybe my home value will be increased because of the duplex next door by the time I sell. Then again, maybe the value would have appreciated anyways. It is completely hypothetical at this point. As I get to the end of this entry, I realize in the greater context of the world’s problems, how Portland does residential development is a pretty minor thing. However, framing the issue as a pro vs. anti argument is an overly simplistic way to stifle any sort of discourse about regulations. I am not against building but I personally believe it should be in harmony with the neighborhood it occurs in. Portland’s few regulations mean that huge monoliths can replace quaint homes. For those who make the argument that an owner should be able to do whatever they want with their property, my perspective is this: the Ayn Randian, me-only paradigm sells-out and otherwise diminishes core Portland values such as interconnectedness, community building. These homes price out the poor and working class as well as detract from the aesthetics and livability of Concordia. I believe we can do better to maintain unique Portland neighborhoods and protect our most vulnerable neighbors while allowing thoughtful and mutually beneficial construction to occur. Part 6: Flooding concerns, Sunday workday, nasty interactions, and garbage.